Cabin Fever Days and the Barstool Ski Races are a family, community event that takes place in Martin City, Montana, located in the Gateway to Glacier – Badrock Canyon. Celebrate the 41st Annual Barstool Ski Races at Cabin Fever Days, February 8th -10th 2019. There are tons of family and adult activities throughout the Cabin Fever Days weekend throughout the Canyon. The Barstool Ski Races are fun for the whole family to watch, with different race classes and two days of racing culminating in the finals on Sunday, February 10th. There are even kids races on Saturday, starting at noon! Adult activities include live music all weekend in several locations, and competitions of strength, skill and wits with cash prizes. This weekend long event is a local non-profit fundraiser, which benefits the Canyon QRU (Quick Response Unit), Martin City Volunteer Fire Department, Canyon Kids Christmas Fund and the Canyon Community Group and more! Not only is Cabin Fever Days a great time, but it’s also for a great cause. A $5 Cabin Fever Days entry button is required for all Cabin Fever Days Events and to ride the Shuttle. Get your button at one of the following locations: Stonefly Lounge, Packers Roost, Southfork Saloon, Deerlick Saloon, Dam Town Tavern, or Dew Drop Inn. “Get out of Jail” buttons are also available – and recommended. 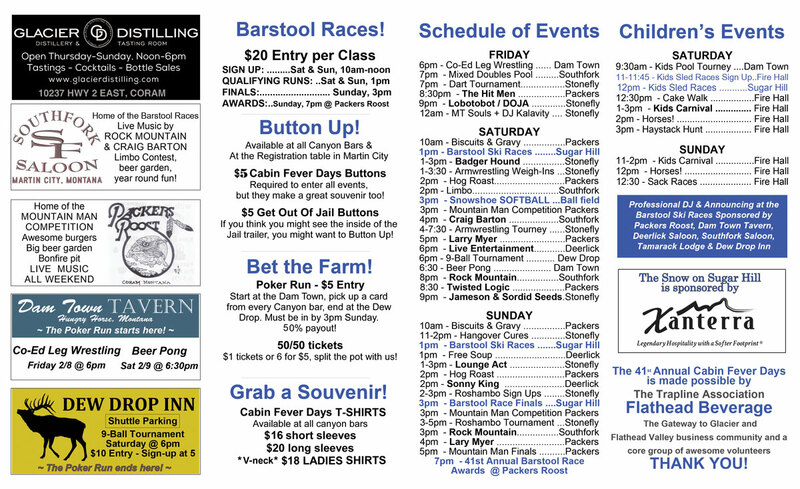 Your Barstool Race experience is not complete without a trip to the Cabin Fever Days jail! Support the fundraiser by becoming a Trapline Association member. A $5 membership fee, payable at the entrance to the winter festival, includes your Cabin Fever Days button. 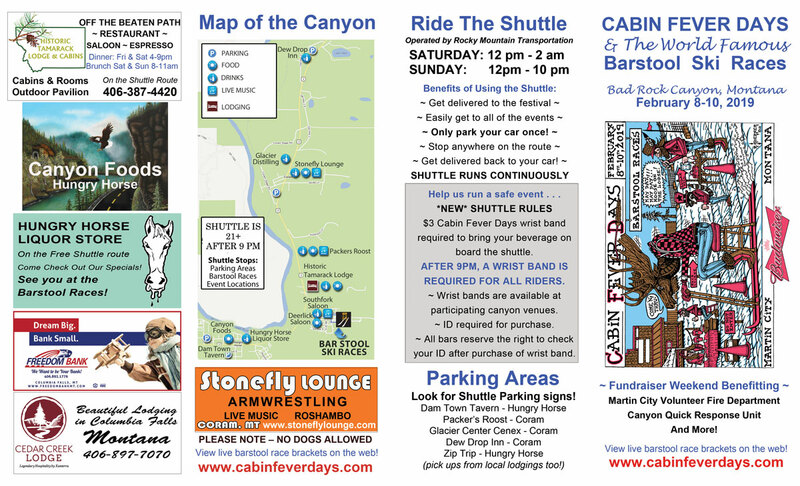 PLEASE SUPPORT OUR FUNDRAISER: Purchase of Cabin Fever Days or Get Out Of Jail button kindly requested when riding the Shuttle to the many events at Cabin Fever Days. Thank you for supporting our fundraiser!